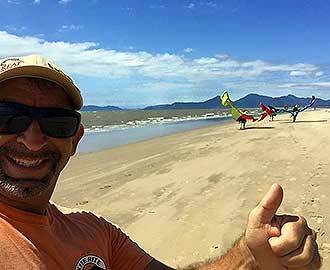 All of Kite Rite Australia’s Cairns kite boarding instructors are trained and certified with the International Kiteboarding Organisation (IKO). Most are also sports instructors or have a background in professional tuition. At Kite Rite Australia, we teach you how to kite board with safety, experience and guidance. There’s no big kite boarding egos here. We’re genuinely passionate about this sport and making it accessible for anyone who wants to learn it. Our Cairns kite boarding instructors are consummate professionals, providing a friendly introduction to the sport. Hand-picked for their ability to make students feel safe and comfortable, our focus is on the sport. We teach you to be self-sufficient. We explain, demonstrate and then let you practice for yourself, guiding you through your skills, through correction and re-demonstration, until you get it right and understand what you are doing. Of course the ‘fun focus’ underpins all that we do too, if it’s not fun, you’re not doing it right. Kite Rite Australia use the latest, NAISH and NORTH kites, boards and equipment for all of our kite surfing lessons. This means you are guaranteed the best safety, using the latest equipment. It also means you can ‘try before you buy’. If you like the gear you use, you can buy it in our shop. Which means you learn your skills on the same equipment you’ll be using on your own. The perfect scenario when starting any new sport.